Doctor Who: It's Catharsis, But The Moment Has Been Prepared For.... | Warped Factor - Words in the Key of Geek. Chris Morley charts the purging of a great burden. 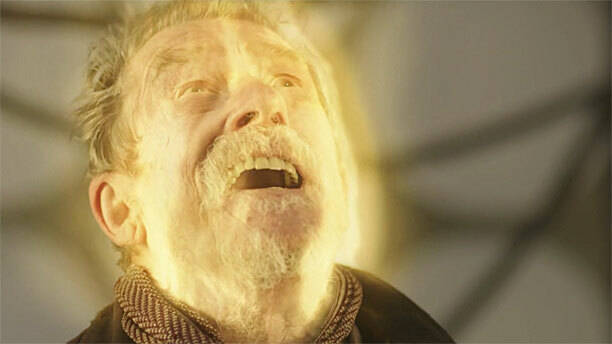 Almost as important to Doctor Who as the manner in which you arrive is the state in which you leave it, and the late Sir John Hurt's acceptance of the mantle of War Doctor gave us a degree of closure on the Russell T Davies-era defining Time War. But what did it mean for Christopher Eccleston, the man tasked with retroactively taking over from this giant of stage and screen? Proof that the regenerative process is indeed a lottery would soon arrive, though! DOCTOR: You think it'll last forever, people and cars and concrete, but it won't. One day it's all gone. Even the sky. My planet's gone. It's dead. It burned like the Earth. It's just rocks and dust before it's time. DOCTOR: There was a war and we lost. DOCTOR: I'm a Time Lord. I'm the last of the Time Lords. They're all gone. I'm the only survivor. I'm left travelling on my own 'cos there's no one else. Even the Daleks, whose final end he had been hoping to see since his recorder-playing days, survive, having become religious fanatics devoted to the worship of their Emperor. Who's developed a rather large God complex! DOCTOR: Do you know what they call me in the ancient legends of the Dalek Homeworld? The Oncoming Storm. You might've removed all your emotions but I reckon right down deep in your DNA, there's one little spark left, and that's fear. Doesn't it just burn when you face me? So tell me. How did you survive the Time War? EMPEROR: They survived through me. DOCTOR: Rose, Captain, this is the Emperor of the Daleks. EMPEROR: You destroyed us, Doctor. The Dalek race died in your inferno, but my ship survived, falling through time, crippled but alive. DALEK : Do not interrupt. DOCTOR: I think you're forgetting something. I'm the Doctor, and if there's one thing I can do, it's talk. I've got five billion languages, and you haven't got one way of stopping me. So if anybody's going to shut up, it's you! Okey doke. So, where were we? EMPEROR: We waited here in the dark space, damaged but rebuilding. Centuries passed, and we quietly infiltrated the systems of Earth, harvesting the waste of humanity. The prisoners, the refugees, the dispossessed. They all came to us. The bodies were filtered, pulped, sifted. The seed of the human race is perverted. Only one cell in a billion was fit to be nurtured. DOCTOR: So you created an army of Daleks out of the dead. Initially, then, enough chips on his shoulder to open a chip on the shoulder shop - to paraphrase the Dream Lord he'd encounter within two further regenerations. But from his first encounter with Rose Tyler in the story bearing her name, the seed is sown for him to truly become the Doctor again, a name he had shunned. Of course, in a sense he'd seen her before, the Moment taking her form & giving him a glimpse of his future. It's she who helps him along in the process of casting off his survivors' guilt, undoubtedly, staying by his side until the bitter end & delivering the unintended kiss of death. Which for him serves as a sort of catharsis, allowing him to begin anew. Finally he's able to cast off the shackles which have so dogged him throughout this life. A life which had in a sense been shaped by death from the off. Little wonder he's overjoyed when everybody lives in The Doctor Dances! "Oh, come on. Give me a day like this. Give me this one." Who can begrudge him his gleeful waltz to a little Glenn Miller with the work of the Chula nanogenes undone? DOCTOR: Rose! I've just remembered! DOCTOR: I can dance! I can dance! Fleeter of foot no doubt having danced through the fires of war in his recent past. And that is surely Sir John's great legacy - the veil of secrecy over the Doctor's actions in his darkest hour lifted, allowing him to accept himself & move on. Allowing the programme itself a new start - almost 2005 all over again for those of us who had been there at the moment of rebirth. All leading up to Eccleston himself gearing up to hand over to David Tennant for a changing of the guard every bit as important as that from William Hartnell to Patrick Troughton to the modern viewer. As the Ninth man to take the helm of the TARDIS once told his companion, "you were fantastic". And, do you know what? So was Sir John.